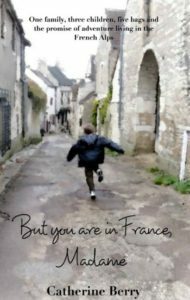 The following is a guest post by Catherine Berry, author of But You Are in France, Madame. There was no doubt that it was tough. Not in a life or death way – that was to come later. But, we had no right to complain, as it was personal choice that had led us to where we were, living in the beautiful French Alps. Our newly set-up blog pages quickly became filled with smiling faces, stunning backdrops, mouth-watering recipes and intimate dining experiences, making it look like we were to be envied, far away from the asphyxiating repetitiveness of our pre-France life in Melbourne, Australia. But it was an exercise in well-crafted design and unintentional deception as our family of five struggled on a daily basis with isolation and constant cultural differences. “You don’t eat sushi outside Paris” joked our French-born, perfectly tri-lingual friend one balmy summer’s evening ten months or so into our adventure, squinting down at the distant lights of the Arno River working its way through Florence, and over a plate of spaghetti linguini served on the terrace of his Art Deco house. He had not been fooled in the slightest by our attempts to downplay the difficulties that we were encountering in our efforts to infiltrate the French administrative system. He knew from long years of experience that the French way of life was a complex layering of rules, lived with pride and unconscious application to detail. But, it was what it was and his words were a gentle reminder that the sooner we relaxed and let ourselves go with the French flow, the easier living there would be. So, we did. We did our best to be French, feel French and accept differences as neither right nor wrong. Just as our first self-congratulatory, ‘yes, we’ve done it, we’ve found our place here’ thoughts were cementing their place in our minds, we were cruelly reminded that in life there is no place for self-satisfaction and complacency. But you are in France, Madame is our French story. It is not a cookbook, nor a travel guide, nor a serious analysis of French customs and society. It is a glimpse into French living as we lived it with our moments of happiness, confusion, sadness and heartache. Let me recount one little anecdote: At the collège (junior high school) for a parent-teacher interview, I met my daughter outside in the courtyard and she showed me up to her classroom. Her teacher was busy chatting, so we waited patiently in the corridor. When he did come out, he indicated that the meeting would take place downstairs and headed off with us in tow. Before sitting down, I introduced myself using my first name, and put out my hand to be shaken. He mumbled back his full name as he took my hand, although I suspect he would have been shocked if I had actually dared use it. By this stage, I had already understood that teachers did not expect to be questioned about their practices. Of course, I did—question him, that is; politely and almost deferentially. There was a slight pause, as he dipped his head to better digest what he had heard. Then, with the assurance of a perfect, unarguable answer, he replied, “But you are in France, Madame”. And now – a confession. I am not a writer. Of course, I write – notes, to-do lists, letters to excuse my children from school activities, the occasional blog and hundreds of emails, but with one memoir to my name, I have not earned my stripes. And, when I read, I try to read in French. My real passion is France and the French language. Nonetheless, if you have ever wondered what it would be like to unzip and discard your current lifestyle and slip on life in the country of haute couture, please try on But you are in France, Madame for size. 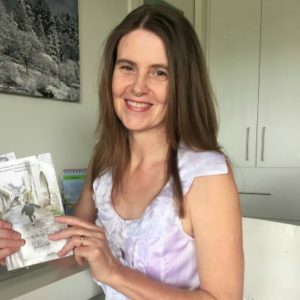 More about the author and her work: Catherine Berry’s blog. It got to me. Living in France was supposed to have a beginning and an end. It nearly did have an end in a way that I could never have imagined, but now it can’t. I belong amidst the bewildering complexities and incongruences of French life, and wherever I am, for as long as I am, this will not change. Nothing from my Australian upbringing pre-supposed this French fascination. My first steps in the language were coincidental, and it was probably luck that saw one of the young, groovy teachers allocated to my beginner’s French class at school. I enjoyed writing, but was gently encouraged into maths and science subjects, where non-essential creative writing was relegated. Thereafter, I adopted an academic approach to getting through an undergraduate degree, teaching diplomas and a master’s degree in education. Despite these intervening diversions, my French obsession remained present and it was only natural that when my own children were old enough that we head to France. Returning to Australia several years later and to a new city, I forewent teaching in favour of writing. It made the transition easier and was a wonderful way to not forget our special few years. But you are in France, Madame was the result.